The Fourth Assessment Report (AR4) of the Intergovernmental Panel on Climate Change (IPCC) concluded that global warming is "unequivocal" and that most of the observed increase since the mid-twentieth century is very likely due to the increase in anthropogenic greenhouse gas concentrations, with discernible human influences on ocean warming, continental-average temperatures, temperature extremes, wind patterns, and other physical and biological indicators, impacting both socioeconomic and ecological systems. It is now clear that we are committed to some level of global climate change, and it is imperative that this be considered when planning future climate research and observational strategies. 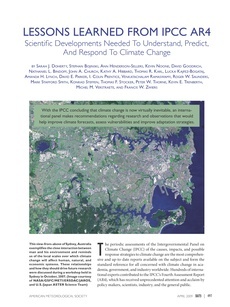 The Global Climate Observing System program (GCOS), the World Climate Research Programme (WCRP), and the International Geosphere–Biosphere Programme (IGBP) therefore initiated a process to summarize the lessons learned through AR4 Working Groups I and II and to identify a set of high-priority modeling and observational needs. Two classes of recommendations emerged. First is the need to improve climate models, observational and climate monitoring systems, and our understanding of key processes. Second, the framework for climate research and observations must be extended to document impacts and to guide adaptation and mitigation efforts. Research and observational strategies specifically aimed at improving our ability to predict and understand impacts, adaptive capacity, and societal and ecosystem vulnerabilities will serve both purposes and are the subject of the specific recommendations made in this paper.